For one week in London, there was a strange, striking light reaching into the sky after dark. You could see it clearly for miles around. 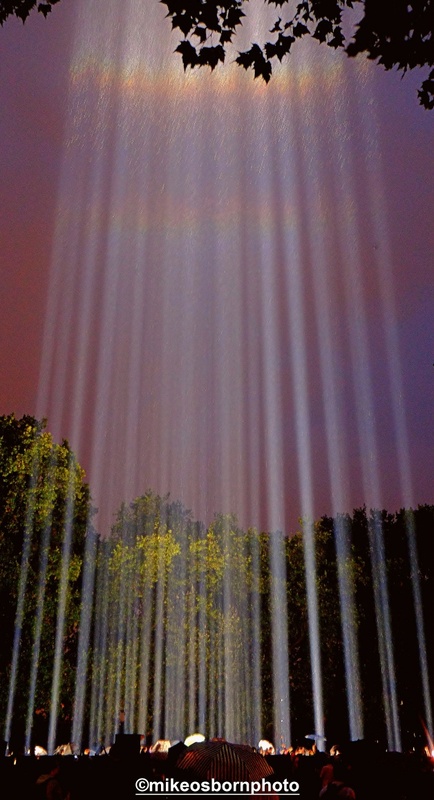 This was an artistic installation to coincide with the centenary of World War One by Ryoji Ikeda which was placed close to the Houses of Parliament. We joined the many Londoners who visited the source of the spectral column – 49 searchlights accompanied by a haunting, minimalist soundtrack. Our visit was accompanied by heavy rain, which I though would ruin the chance to take photographs. But of course the lights picked up the deluge and created a wonderful spectacle. I even allowed my camera to get a little wet. All the visitors wandered around in awe at the light piercing into the sky, unfazed by the downpour. There was an eerie sense that they had gathered to be lifted up by extraterrestrials. When the light was turned off, it was missed. This was something special. Thanks Kiki, well it was a little unusual (in a good way). I had the sense we were about to be lifted to the heavens! Those images are amazing. Brilliant work capturing the light so well (and a shout-out to the rain!). Thank you very much, Mo, much appreciated. The rain definitely gave it an extra edge. But my efforts to do some longer exposure shots were thwarted – the camera doesn’t like getting very wet! These are very different photos and the rain made them extra super special. What an experience that must have been. Thank you Lee. My heart sank when the rain started (unlike your recent experiences!) but it was a welcome twist to the tale. They were quite tricky to edit, though, as they’re very different to the norm. I could imagine that, but they turned out really well. Thank you! They could have been more impressive with some long exposure – but my camera wouldn’t agree to that in the rain. Impressive project. The rain gives a special effect on the lights. I love the one with the red ‘shades of raindrops’. Wonderful captures – quite envious of this experience. Thank you Diana. It was full of atmosphere and mystery, especially with many people milling around with umbrellas. Perhaps it will come back one day or show up in another city. Wonderful photos Mike! I like your creative approach to photography! Thank you Elina, much appreciated. It’s the occasion that helps creativity, and this was certainly one of those. Nice event and awesome pictures! The rain made these pictures really special. It looks like the rainbow appeared in the last shot! I know, Linda! But this rain was welcomed in the end. You’re quite right about the significance, but I found it hard to make the connection, being so bowled over by the installation in its own right and the difference it made to the London skyline. I’m glad you found a connection to near ancestors and the sacrifice they made a century ago. Superb set of images – I only heard abut this after the event. We were at the Tower of London last sunday to see the Poppies and to listen to the Roll of Honour at sunset. Very poignant – I’ll be posting some images of that tomorrow. Well worth visiting if you get the chance. Thanks Andy, much appreciated. Yes, I’ve been looking at the Tower of London poppy tribute. It’s quite astounding. I’m disappointed us mere mortals don’t have the chance to get closer like the younger Royals did recently. But it’s understandable why. I must go and look at your photos. Sadly the closest I got to this was the TV news :( Your photographs and text however have created a wonderful impression – and I’m even more disappointed that I wasn’t able to experience it myself! Thank you Noeline, I’m glad you enjoyed the post. I’m sure there were countless millions of photos, but I don’t think that serves as a deterrent. What a shame you weren’t able to see it – I’m sure it would have been memorable. It wasn’t the easiest of sets to edit. When there are millions of photos of somewhere/something it’s a challenge to rise to; something you have pulled off with this wonderfully intimate collection. Thank you very much, Noeline. The beams of light could not be ignored, but I was drawn to the source of this light. The heavy rain certainly enhanced the mix.